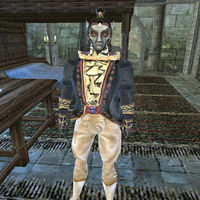 Odral Helvi is a Dunmer monk and House Brother of House Hlaalu who resides on the second floor in the Governor's Hall in Caldera. Follow the northeastern spiral staircase up until you get to a wooden door. He offers medium training in Acrobatics, Hand-to-hand, and Sneak to members of his House. Erirvase Drinith says he wants to set up a netch ranch of his own in the Ascadian Isles, but that none of the locals are willing to sell him any land. He is also disliked by Gadela Andus. He wears an extravagant shirt with matching pants, shoes, and gloves, and a Ring of Stormhand. He carries a Steel Staff of Peace, the key to his chest, and up to 50 gold. "My name's Odral Helvi. I help keep the mines running and make sure business goes smoothly." After completing the Shipment of Ebony quest for House Hlaalu and turning in the ebony to Segunivus Mantedius, Odral will no longer be found in the Governor Hall, having apparently been put on a prison ship. This page was last modified on 9 July 2018, at 02:06.